When we think of a snack, “seaweed” doesn’t really come to mind. But nori and its adaptability works for so much more than just sushi. These, trust me, are pretty addictive. Preheat the oven to 350F. Lay 2 sheets of nori on a cutting board. Use a pastry brush to lightly brush water on the sheets. Only use a little, they should be slightly sticky. If you soak them, it will become soggy. Take the two remaining sheets and lay them atop the ones with water, completely covering each one. This is to make a “thicker” piece of nori, a more substantial crisp. If desired, you can layer another sheet to make them thicker. In a small bowl, mix together the oil, maple syrup, and curry paste. Use the pastry brush to brush the mixture on top of each doubled nori sheet. 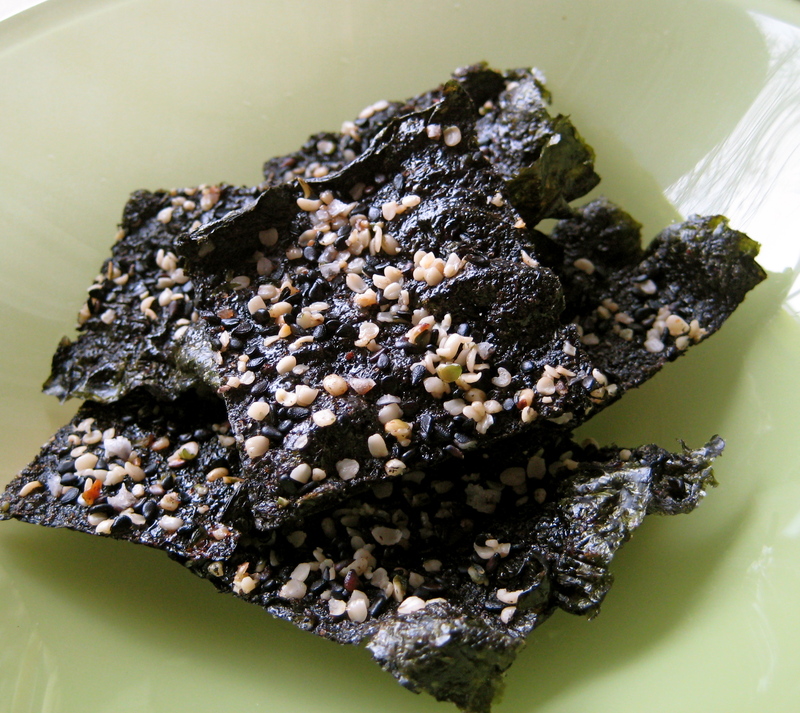 Sprinkle the sesame seeds, hemp seeds, and salt on the nori, pressing into each one. Bake for 12 to 14 minutes until crisp. Cut into squares using scissors while still warm. They will crisp more once they cool. Wow these sound tasty. Why have I never thought of making these myself instead of buying nori snacks. Genius.